Have you ever wondered what gear we like to travel with? 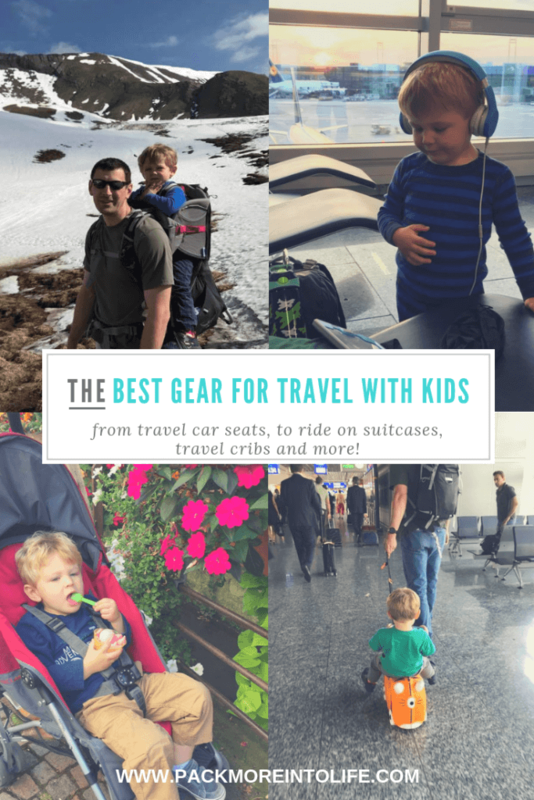 I’ll share everything from our favorite travel accessories to the best travel stroller, portable car seat (travel car seat), and travel crib. Everything on this page includes items we actually use. They’ve traveled all over the world with us from when our son was 6 months old until age 4. Our needs have changed as our son gets older and we are packing a lot less, but we know that our readers still have little ones, so we included our must have’s for traveling with babies. We will tell you what we loved and what we didn’t love. Let’s start with some baby travel gear. When we started researching pack and plays, we knew that ours would need to be portable enough for travel. We researched the various styles, their overall weight and ease to set up. It came down to two: the Baby Bjorn and the Lotus Travel Crib. In the end, the lotus won for its open zipper in the front. The Baby Bjorn crib is faster to set up, but the lotus packs much smaller and has backpack straps allowing it to be easily carried. Both work great as baby travel cots. We used our lotus frequently and were able to bring it on the plane as a carry on, due to its small size, on our first trip with the baby to Maine. I loved being able to open the zipper and climb in to soothe or nurse my son in those first few months. It also doubled as a safe play space in the hotel, which came in handy quite a few times. We did purchase the extra mat for the lotus and sheets for a perfect fit. Once our son outgrew his Lotus Travel crib, we switched over to a blow-up toddler bed with rails. We found a slightly used AeroBed Air Mattress for Kids and it has served us well over the past few years. We like that it includes a sheet, folds small, inflates quickly and stays inflated throughout the night. The higher edges prevent our son from falling out of the bed and he sleeps well. This is something I did an enormous about of research for. I needed something that could handle the cobblestones of Europe, but still pack tight for small rental cars and airline travel. I needed travel accessories like a padded stroller bag and parent console to stuff snacks and drinks. I also wanted something that could grow with my son and last for the long haul. We ended up choosing the Baby Jogger City Mini GT. We chose the GT version for it’s larger wheels, handbrake and adjustable handlebar (a must for a tall husband). You can use the City Mini GT from 6 months old up until about 5 years old. Many of the other models we looked into, like the UppaBaby Vista were much more expensive, weren’t able to pack as flat and even though the toddler seat goes up to 50 lbs, children quickly outgrow its length. Our Baby Jogger City Mini GT also stood the test of time. Even after over 20+ flights and thousands of miles logged, it was still in wonderful condition. We didn’t have any issues with anything breaking or becoming damaged. A lot of that was due to the travel accessories we added. We only ever flew with it packed away nicely in the Baby Jogger stroller padded travel case and made sure to remove the wheels and tuck the handle. We always had plenty of space for extra diapers, wipes, blankets, stroller footmuffs and more. It comes with a nice handle and shoulder strap. There were a few times that we didn’t want to travel with our City Mini GT and we wanted something smaller. When researching umbrella strollers, we quickly figured out that we needed a nice set of wheels to handle the European cobblestones. Our search led us to Maclaren. From there, we knew we needed something that reclined for naps on the go, had a nice large sunshade, folded easily and was lightweight. In the end, we chose a Maclaren Quest. It was great for quick trips into the city or trips that wouldn’t require as much stroller time or lots of stairs, like Lake Como in Italy. Another really popular stroller is the gb pockit stroller. It is the smallest stroller currently on the market and weighs only 9.5lbs, making it very popular among the family travel crowd. I also have friends that swear by this stroller and have enjoyed it for years. We never took the plunge due to my husband being 6’3″ and our son always being 99th percentile for height and weight. What you gain in portability, you’ll lose in comfort (no recline), protection (very small sunshade), but it says it can support up to 50lbs with another 11lbs in the storage compartment under the seat. Again, we’ve never owned one, but some of our friends swear by them and it might be the right choice for your family. We’ve seen some amazing deals for this stroller on Amazon (especially during Black Friday). You can have fabulous gear, but if you don’t protect it, you’ll be upset when you receive your stroller at the baggage claim damaged or soiled. The upfront purchase can be a bit much, but spending a little bit to protect an expensive stroller is worth the cost. We traveled all over with our Baby Jogger Padded stroller bag. We loved that the material was heavy duty, the zippers were strong and it could expand to accommodate more items inside the bag along with the stroller. It comes with a carrying strap and a handle for easy transport. We would fold the stroller down, pop the wheels off and tuck them in and around the stroller. This allowed the stroller to fold as flat as possible and protect the wheels from getting banged around. Then we had plenty of room for extras such as diapers, wipes, blankets, extra winter stroller gear and more. We also “baggage checked” our stroller. We didn’t want the hassle of packing the stroller before we boarded the flight, so in the beginning, when our son was little, we just wore him in our Tula or Kinderpack baby carrier. When he got older, we just carried him on our shoulders or walked slowly. Tula: Yea, I know! What’s the big deal about a Tula? Yes, they have super cute prints, but they are also really comfortable. We owned an Ergo before I discovered Tula and for some reason, my two Tula’s were just more comfortable. The fabric was soft and I felt like the adjustment points just fit my body better. I also really liked the little pocket at the front for a couple cards and a cell phone. If you don’t want to buy new, check out all the great Tula BST (Buy/Sell/Trade) groups on Facebook. Lots of great deals on gently used carriers. Kinderpacks: Then I discovered kinderpacks and the mesh panel sold me. (Tula and other carriers have now added mesh.) We were headed into Summer and I was an avid baby wearer. As my son got older and so much heavier (6-month stats: 22 lbs and 27″), I switched him to my back. I could go into a store and carry on a conversation without anyone being the wiser to the little one on my back. It was a lifesaver! I also loved that kinderpack went up to a toddler and preschool size. It could found up small and be stuffed into a backpack or worn on my (or my husbands) back and off we go. Our Toddler kinderpack was perfect for a barefoot walk in the German forests. Another major plus about soft structure carriers is in the airport. When wearing your child, you DO NOT have to take them out of the carrier to go through security. You’ll be sent through the metal detector and might have your hands swabbed and tested. This allows your little one to stay snug and close to mom or dad and away from all the germs and stress of security. In addition to what we call soft structured carriers (Ergo, Tula, Kinderpack), we also owned a nice Osprey Poco Premium. We added this to our kid’s travel gear line up because we are outdoor enthusiasts and knew we would be doing some amazing hiking (Switzerland, Austria, Slovenia). This child carrier distributed the weight, allowed us to pack more gear and also lifted our son up above my husband’s head so he could also get a nice view. My husband was the only one to wear the carrier, I didn’t find it comfortable with how heavy our son was. I do have friends that are able to carry their children using hiking carriers, but for me, it was too uncomfortable. This type of carrier is best used for children ages 9 months and up because they need to be able to have core control to support themselves. Some things to consider when looking at child hiking carriers include feet stirrups, sunshade, supportive seat position (knees up), and ease of use. Our Osprey Poco Premium fit all of those requirements, but they are very expensive. If possible, take a look around on the buy/sell/trade boards online to see if you can pick up one used. Just be sure to look it over carefully for any structural or strap damage. Hiking in Slovenia, the carrier is also great for a quick nap. Our only regret about the Osprey Poco Premium child hiking carrier is that it didn’t accommodate our son’s height for as long as we would have liked, see above photo (our son is too tall to nap comfortably). We chatted with a friend about this disappointment and she let us borrow her Deuter Kids Comfort III. The seat in the Deuter lowered much lower (allowing our son to rest his head on the face pad), which is important for nap time. Otherwise, the two carriers are very similar in their structure, features, and sunshades. Ah, the dreaded car seat. No one ever likes to think about dragging around their child (or children’s) car seats. They are bulky, heavy and no one wants to check them for fear of damage in transport. We dealt with the pain of dragging around our son’s car seat until he turned age 3, then we were able to switch to a travel harness (more on that later). In the meantime, here is our favorite travel car seat (along with accessories). Cosco Scenera Next: This is the best car seat for travel. Why? This is as good as it gets for a lightweight and inexpensive seat for travelers. It is airline approved for all flights, easy to install and narrow (again, makes it easy for on the plane as well as compact rental cars). At under 10lbs in total seat weight, you can strap it to your luggage or add a car seat stroller so that it doubles as a stroller! In addition, you can install it either rear or forward facing. You seriously can’t beat its portability. What we didn’t like about the seat: It was hard to install and get a tight fit. It will only work for children up to 40lbs (average size of a 4-year-old) and it shows wear and tear much quicker than nicer $300+ seats. Perhaps that is also due to its wear and tear while traveling. When carting around your travel car seat, you’ll need a few accessories. We have read all the research about not checking a car seat, but our son hated his car seat on airplanes. He preferred to be snuggled in my arms, usually nursing. So since we invested in a travel car seat, we used a padded car seat bag with backpack straps or the rare occasion that we took his car seat on the plane, we pulled it along using a the Go-Go Babyz Mini car seat cart. It folds super small, works with the majority of car seats, including the Cosco Scenera Next. When your child finally reaches the magical age of 3 (and at least 30 pounds), then the Ride Safer Travel Vest is an option. This travel vest is a game changer. It packs flat, can fit inside a suitcase or backpack and can be used in any vehicle with a traditional cross body seat belt. Check the RideSafer website for particulars about its crash test safety and different sizes. Please note that in order to use the Ride Safer Travel Vest in Europe, you must also have a booster seat. We purchased the BubbleBum Backless Inflatable Booster Car Seat, but the two have not been tested in combination with each other. Ride Safer hopes to come out with a recommended booster to accompany it’s Ride Safer Travel Vest. I will say that your child MUST be well behaved to travel with this vest or you should use the teethers to make sure that they stay seated in the proper position. When my son was 3 and we were practicing with this harness, I would sit in the back seat with him. We also only used it for short car trips (like from the airport to our Airbnb in a Taxi). We’ve been using the travel vest for over a year now and we still love it but see our pros and cons below. It does take a bit of time to get accustomed to putting on and situating the Ride Safer Travel Vest on your child and in the car. We found that having our son stand outside the car, then picking him up and getting him settled on the booster seat worked best. From there, we would align the seat belt over the shoulder and then over his lap before buckling. Be sure to practice and get the Travel Vest adjusted to their height before leaving on your trip. The Ride Safer Travel Vest is also great for Taxi rides, carpooling and trying to fit 3 children into the back of a car (I can attest to this one). We successful fit two car seats and our son with his Travel Vest in our Subaru Crosstrek for a trip to the zoo with friends. This has been our favorite portable car seat for our toddler. Read Next: Ultimate Guide to Lightweight Car Seats for Travel and Everyday use. We’ve bounced around in this category. We’ve tried the Trunki luggage, a ride on Ferrari scooter, a typical roll behind you style luggage and a backpack. Here are our thoughts on each. Trunki Original Kids Ride-On Suitcase and Carry-On Luggage: We honestly thought we would love this concept. Who wouldn’t love a ride on suitcase? We ended up finding a cute used one before our trip to South Africa. Our son thought it was really fun to scoot himself around the airport, but when we tried to pull him along using the strap, it was hard to steer and easy to tip. In the end, we only used it for one trip. I will say that Truki recommends their ride on suitcase for ages 3+, but it is quite small and I couldn’t image by 40+lbs son riding on a small plastic case. Headed off to South Africa! Since our son was a bit older and loved riding his scooter, we decided to “upgrade” to the Ferrari Rolling Luggage Suitcase Scooter. We picked the Ferrari brand over the popular ZincFlyte Kid’s Luggage Scooter because of their poor reviews on Amazon for it breaking easily, not fitting well under airplane seats and having to unzip the entire thing to access the contents. We still really like the Ferrari Rolling Suitcase Scooter. It has a smaller footprint, it is easy to steer and I can help steer my son by walking behind him. The suitcase portion is large enough to fit his airplane toys, some snacks and a change of clothing. Plus it folds up small if I need to carry it in a hurry. All in all, it’s a win! Kids rolling luggage: I’d only recommend getting your child a rolling suitcase once they can wheel it around themselves. Otherwise, it is just one more thing YOU will be carrying. The smaller and more lightweight the better so they can easily maneuver it and it deters from packing the entire Lego collection (or barbie house). Wait? Doesn’t everyone ask their kids for packing suggestions? Backpacks: A great option for older kids and toddlers. My son really enjoyed having his own backpack and accessing his own snacks at a moments notice. Be sure to keep the backpack child-sized and light for toddlers. Here is our favorite Deuter child-sized backpack with its multiple pockets, supportive straps, and chest buckle. Ok, this is where the magic happens! At 30,000 feet in the air, you want to be prepared for anything! Here is the tried and true list of items we carry on airplane trips. Tablet: Yes, this can be controversial. Some parents hate screen time, I’m honestly included. But unfortunately, my child didn’t master sitting quietly without something to entertain him for hours on end. Giving your kids a tablet can be used in a variety of ways: digital books to read, engaging educational apps, PBS kids shows and more. We do a mix of all and add in some favorite tv shows and movies. We’ve tackled short flights and overnight 14-hour flights 1/2 way around the world, the tablet was our savior. Headphones: Our favorites are LilGadgest Connect +. Why do we love them? They fold small and store away in a nice storage bag. They feature volume limiting, cushy headband and ear covers, no pinch connections and you can even connect multiple pairs to the same device (a great feature for multiple kids). They are best for ages 3+, but we started using them around age 2, which is when our son would even start wearing something on his head other than a hat. Kids footrest: Ok, this one may seem odd, but hear me out. The First Class Travel Pillow has saved our life multiple times. Have you ever taken an overnight flight with a kid who hates sleeping in his car seat? I think that only happens once because it’s such a terrible experience! It seems impossible to get some rest when all the kids want to do is snuggle up and go to sleep. Insert the First Class Travel Pillow. It’s basically a huge blue velvety pillow that you manually inflate to fill the floor space by your child. Once inflated, they have an extension of their seat. Which also equals less lost toys that get dropped. Bonus! On our flight to South Africa from Germany, we ended up in the dreaded middle row. We did get a bit of luck with four seats and only three of us. That meant our son could sleep in the middle two seats while my husband and I sat on the aisle seats. But our First Class Travel Pillow didn’t go to waste! I actually curled up from my seat over to the pillow and enjoyed a couple hours of rest too! It folds small enough to be placed inside a large backpack or rolling carry on, it’s easy to inflate and quick to deflate and adjustable depending on seat sizing and space. It doesn’t work well with bulkhead seats and many airlines publicly “ban” the use of them. However, not to go against airline regulations, but we only use them in window seats or center aisle seats (preventing an issue with escaping in the event of a crash). We’ve never directly asked nor made it a big deal that we were using it and haven’t had any issues thus far. Just something I wanted to note for you lovely readers. Want to read more about travel pillows, including neck pillows and great options for older kids, head over to this in-depth post about travel pillows by fellow travel blogger friends of ours. We lucked out on this flight with an extra seat in the middle, but you can see the green blanket laying over our travel footrest pillow. Sippy cups: The one place where they serve drinks and don’t offer kids cups, an airplane. Sounds like a disaster? You’re right! So make sure to bring your kids favorite sippy cups. But beware, the airplane constantly changes in pressure during take-off and landing, so be sure that your cup won’t explode in your backpack or carry on. We’ve traveled all over the world with our Thermos Funtainer Bottles. They feature an easy to clean straw, lid closure, handle and insulated core (to keep drinks cold or hot). We’ve never had one explode, but we also pop the top on take off and landing (and never put in fizzy drinks). It’s also best to leave a bit of space and not fill them completely full. We love having our Thermos bottles on hand because that means we never have open cups sitting on the trays ready to tip over or be spilled. CARES Harness: This is another wonderful product that parents love for airplane safety. The CARES Harness is to be used on the airplane ONLY. It is designed to keep your children safe and secure in their airline seat and is used for kids who weigh between 22 and 44 pounds. The best part, it folds small and can easily fit in a backpack or carryon. I’ve included items that we use as adults to help keep the kids happy. Depending on your length of travel, they may or may not be useful, but I wanted to include them just in case. Backup Battery: For long-haul flights and long travel days, my husband and I each carry a fully charged backup battery. We also carry extra charging cables to our devices as well as our son’s tablet. This prevents any mishaps with devices losing power and keeps everyone happy with their podcasts, shows, movies or games. I hope you found this post helpful. Do you have a travel item that you love traveling with? Share it below in the comments, we would love to connect with you! Ready for your upcoming trip, but need some tips to keep the kids busy on the plane? Check out travel toys for toddlers and kids on airplanes. Or perhaps you are ready to book your next trip and you just need a bit of inspiration? Head over to our Destinations page to explore our interactive map of the world. Love this list Chelsea! We are currently trying to figure out the best rolling suitcase for our 4 year old to start rolling. I’ve always just carried her stuff because we don’t travel enough for investing in the scooter one, or the one you sit on. But now she is prob ready to start pulling her own weight LOL! So glad you found it helpful. It’s always hard to know which gear to buy.